A project that was created during the 2015 Global Shadow Jam / Global Game Jam. You control an alien floating in space, you goal is to avoid being shot by the canon on the asteroid. 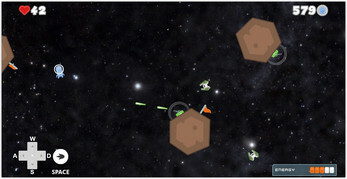 This prototype features gravitational forces from the asteroid, affecting the player character. W, S - Forward and Backward movment.